Genine Nikon GPS unit GP-N100 for Nikon 1 V1 V2 V3 from Japan. Note: This image is an example of using. Nikon 1 V1 is not included. 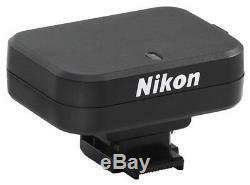 NIKON GP-N100 [Compatible models] Nikon 1 V3V2V1 [Accessories] Soft Case CG-N100 USB cable UC-E15 Mounting legs cover BS-N2000 100% authentic from Japan! NOTE The past few years Japanese manufacturers have many manufacturing plants at China or etc. So, this item is also a Japanese product, but there is a case notation of "Made in China" or etc. Item arrival is different depending on the location and country, it is about 2 4weeks. Note: To Buyers in Germany , Italy , Indonesia , Mexico. Please ask to us correctly. Romania , Bulgaria, Cyprus, Korea, Vietnam, Qatar, etc. International Buyers - Please Note. We do not mark merchandise values below value or mark items as "gifts" - US and International government regulations prohibit such behavior. The item "Nikon GPS unit GP-N100 for Nikon 1 V1 V2 V3 Genuine article from Japan NEW" is in sale since Wednesday, February 18, 2015. This item is in the category "Cameras & Photo\Camera & Photo Accessories\Other Camera & Photo Accs". The seller is "holoholojapan" and is located in JAPAN . This item can be shipped worldwide.